Robert Orr was the son of Alexander and Mary Orr. He was born at Drumglass, Dungannon on 5th December 1886. Robert was one of 14 children. The 1901 census records Robert as age 14. He was working as a linen weaver. 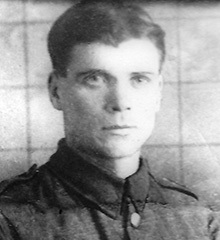 Robert was living with the family in Moygashel, Tyrone. Robert married Martha Jane Liggett in November 1904. They had four children. Newspaper reports suggest he wounded on the first day of the German offensive, which would have been 21st March 1918. Private Robert Orr was serving with the 9th Battalion of the Royal Inniskilling Fusiliers when he died from wounds received in action a month earlier on Thursday 25th April 1918. 4 2nd Presbyterian Dungannon Robert Orr, killed in action. 6 War Graves Photographic Project Photo of Robert Orr's headstone can be purchased here.